IMPORTANT - Restrictions on use 1. Please try to ensure Mr & Mrs Beard at Wilkinsyke Farm (NY176169) are notified prior to flying the site. They need to be able to shut their dog away for safe keeping whilst we fly. Phone: 017687 70237. Unless you definitely know which field we have been granted permission to use YOU MUST agree one with a farmer PRIOR to flying. Ask Mr Kyle at Syke Farm/Café/Ice Cream Shop (NY176170) Phone: 017687 70277 (usually this is for the long narrow field behind and West of the Fish Inn). Or ask Mr & Mrs Temple at Cragg House Farm (NY173171) Phone: 017687 70204 (they have fields next to the shore at the NW end of Buttermere Lake). If you land elsewhere you may be accosted by a member of the Beard family, who have asked that we no longer land in any of their fields at any time, they are particularly sensitive during lambing time (end of March to early June). 3. 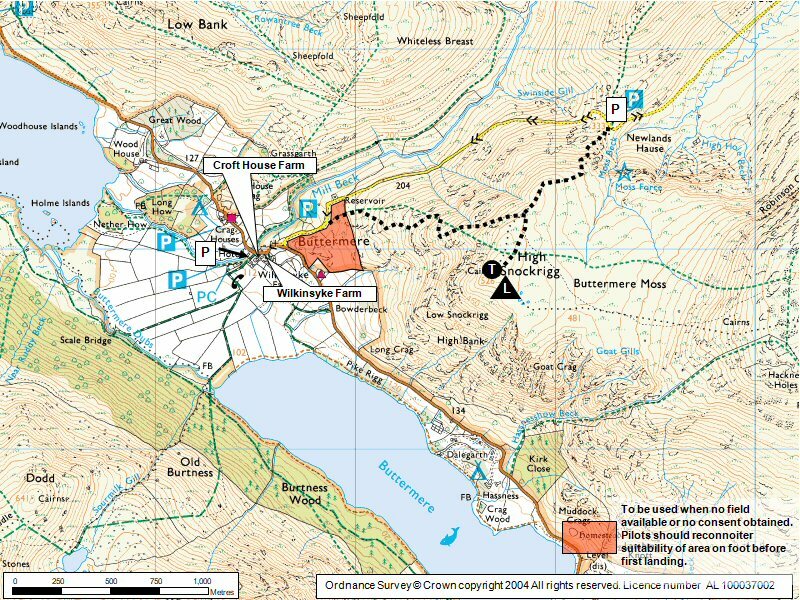 If no permission for a landing field can be obtained then you will be restricted to landing at the foot of the fell - as shaded in orange on the site guide map. This is rougher ground than a field, but should be no issue for competent pilots (best check it on the ground beforehand if you've not used it before). This site has lovely grassy flat-topped take off areas and big fields to land in (as long as you've asked permission). The site makes for a very pleasant top to bottom if you haven't flown for a while. Best flown in a true westerly. Excellent XC potential for the experienced. If heading from Keswick, drive west into Braithwaite. There, take the second left onto a narrow lane that eventually winds up Newlands Pass. At the top of this pass you normally park (NY193176) to walk up (see below). If you have 2 cars leave one in Buttermere Village and drive back up. If you only have one car, leave it in the village and walk east from NY179172. From the top car park, scramble up the steep path leading south. When the path levels out follow it SW to High Snockrigg and choose the best wind-facing slope (from top car park it is an, initially strenuous, 20 minutes walk). Take off is from the open fell land. Mr Kyle, Syke Farm/Café/Ice Cream Shop and Mr & Mrs Temple, Cragg House Farm. Keep an eye on the state of the lakes for an idea of how windy it is down in the valley, and for signs of the sea breeze approaching. On a thermic day the sea breeze may come in from the NW early afternoon, the site will continue working although with reduced lift. Care should be taken if flying in a SW moderate wind due to the big fells across the valley that will cause the conditions to become turbulent. A good site under the right conditions but can become very turbulent in the wrong conditions (see Hazard Notes). This site has lovely grassy flat-topped take off and top landing areas. Excellent top landing area behind take off. Large bottom landings fields in the valley PROVIDED you have permission! Please read restrictions section for more info. 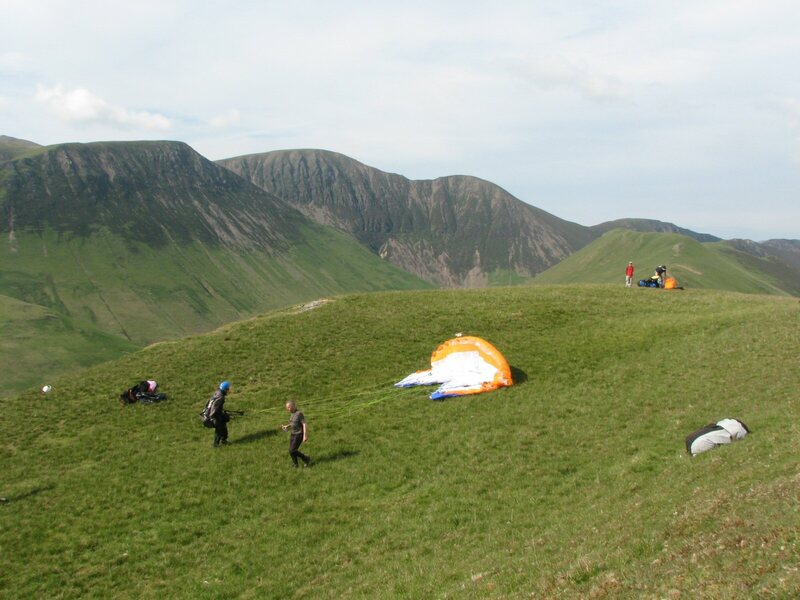 Competent pilots can land back at the summit of Newlands Pass just north of the car park (provided the wind is not too strong); or at the foot of the fell to the east of Buttermere Village. The site still flies well after the sea breeze comes in from the NW but has reduced lift. Buttermere Moss has excellent XC potential in amongst big mountains! The opportunities for exploring up and down the Lorton & Buttermere valleys and beyond are superb. An out & return flight to Robinson, the big mountain 2kms to the east, is a potential XC training task. 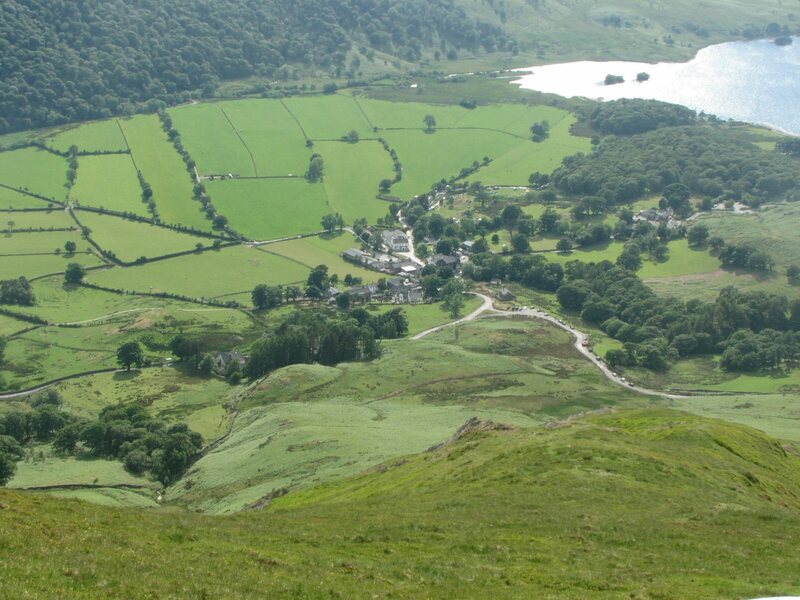 Further afield, for experienced XC pilots, flights to Keswick by various routes are frequently achieved and it is possible to connect via Borrowdale across Thirmere and then up or down the Helvelyn range, with the rest of the eastern Lake District at your feet! General view of parking, ascent route and take off area. One of the take off areas. Essentially the top is a small plateau; choose the best take off spot depending on the wind direction. Looking down to the landing areas from take off. The rough ground area is between the 2 roads to the left of the parked cars. The other fields are behind the Fish Hotel, the prominent white building in the vee. 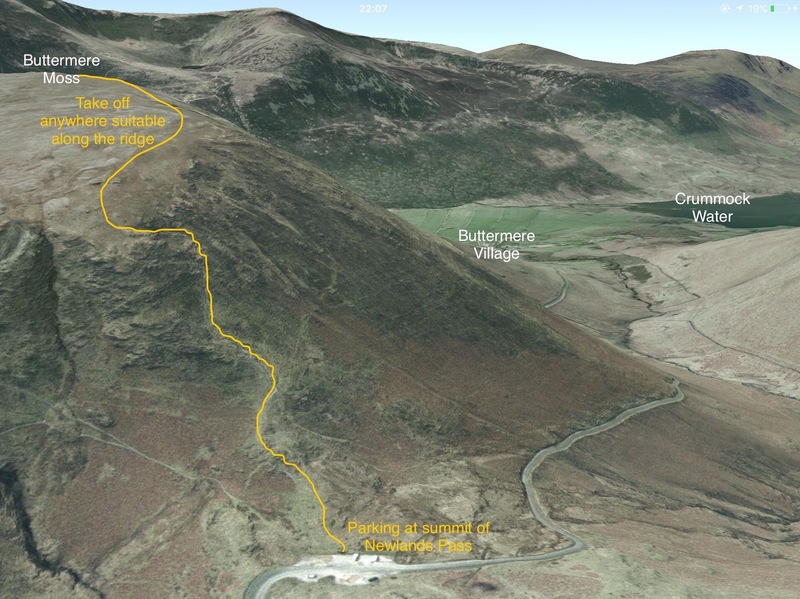 Notes : Both pubs are in Buttermere Village. Both serve food. Google Street View - Parking Newlands Hause parking. The track to take off is the (steep!) one on the right going directly up the nose.